Melody is a writer, comedian and cabaret artist based in Newcastle. Their work ranges from lip sync, playwriting and cabaret performance to zine making and lino printing. They are often inspired by film, queer arts, music and popular culture. In 2018, they graduated from Northumbria University with a Drama and Scriptwriting degree, and was the winner of Live Theatre’s 2018 New Writing Prize. Melody’s playwrighting work covers themes of family, grief and difficult conversations. They have had several of their plays performed at Alphabetti Theatre, Live Theatre and Northern Stage . In terms of comedy, Melody has performed on wacky cabaret nights such as PUG, Bonnie and the Bonnetts Bon Bon’s cabaret, FLIM NITE and is a part of the cringey comedy duo Sowersprouts. 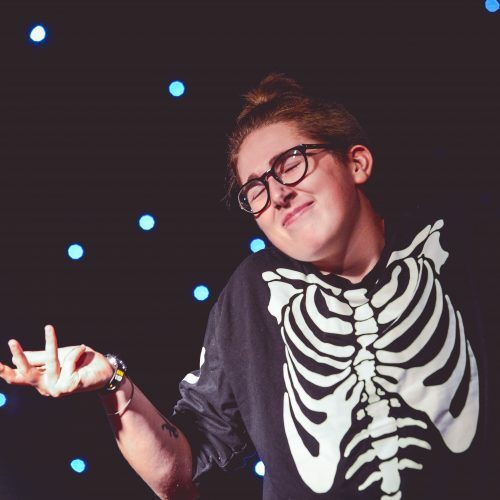 From 2016- 2019 Melody toured You are who you choose to be, a self-contained 15 minute comedy lip sync performance which is a rebellious, personal & comedic outlook on the gender labels that society places upon us. This piece won Curious Art’s queer-itch bursary, which led to a performance at Alphabetti Theatre. It has also been performed Northern Pride festival, GIFT festival, Manchester HOME and was a part of The Camden People’s Theatre ‘Come as you are festival’ which toured at Theatre Royal Wakefield, The Metal Peterborough and The Exeter Phoenix. Their current project *gender not included is their upcoming solo show about identity, non-binary and trans issues. It is supported by Curious Arts festival and has recently received funding from The Arts Council England.